Heating blankets, infrared heaters, air conditions, refrigerators, ovens, vacuum cleaners, exhaust fans (bathrooms/kitchens), hair dryers, computer keyboards, main switchboard, 12 v transformers, transformer stations, currents on the electric wiring coming in on the water or/and gas mains via copper pipes (most old houses) or other conductive materials, and different types of power lines which use the lower frequencies (ELFs) of the electromagnetic spectrum [1,112,113,114]. ​EUROPEAM EMF Guidelines 2016 pg 5 refers to The BioInitiative Report 2012 which states: “Children who had leukaemia and were in recovery had poorer survival rates if their electromagnetic Field exposure was between 1 -2 mG in the place they were recovering; over 3 mG in another study“(1). Cordless phones (DECT), Wi-Fi (wireless Internet access), mobile phones, iPads, tablets, cell towers and antennas, wireless mobile phone base stations, radio and TV broadcast antennas, radar (military, airport, marine and weather), Bluetooth, microwave ovens, wireless devices = home entertainment, headsets, baby monitors, computer games, printers, keyboards, mouse, and home surveillance systems (home offices and cars), wireless utility “smart meters”, TETRA and WiMAX (wireless communication) [1,112,113,114]. ​Measured in m/V = millivolt with a dirty electricity meter e.g. 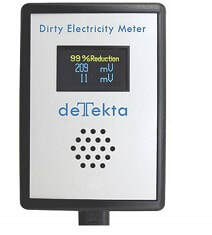 the deTekta which measures dirty electricity from 10 kHz to over 1 MHz and presents the reading as an audio signal. Computers, televisions, Plasma TVs, sound systems, game boxes, printers, copiers, external disk drives, induction cooktops, tube fluorescent lights, compact florescent light bulbs, low-voltage halogen down lighters (with hidden switched-mode voltage converters) as well as some LEDs, dimmer light switches, variable speed motors, treadmills, vacuum cleaners, sewing machines, solar energy inverters, wind turbines, smart meters, and other electronic devices. All of these modern electronic devices add high frequency transients to the electrical wiring in our homes. dLan (direct Local Area Network) which uses the power grid i.e. adapter is plugged into a powerpoint. (PLC = powerline communication). Dirty electricity is a typical residential EMF Exposure source originating from voltage and/or current disturbances. The mentioned devices use current and/or voltage in short pulses that might produce harmonics and very low frequency transients that travel along the electrical wiring and grounding systems and radiate electric and/or magnetic fields into free space leading to exposure in the vicinity meaning that proximity to neighbours can also contribute to the in-home exposure [1,112,113,114]. Synthetic clothing and rubber soled shoes if not often in contact with earth. Microwave Radiation Dangers in Your Home presented by Dr Magda Havas . “High frequency voltage transients can also be caused by arcing on power lines during storms when lines touch trees. HFVTs can also be created from unfiltered cell phone and broadcast frequencies from nearby antennas. High frequency voltage transients in electrical wiring have been linked to many modern diseases and health conditions. Symptoms of Multiple Sclerosis, elevated blood sugar, obesity, migraine headaches, Attention Deficit Disorder, asthma, Chronic Fatigue Syndrome, Multiple Chemical Sensitivity, miscarriages, infertility, depression, suicide, and cancer have been shown to increase with long-term exposure to high frequency voltage transients” . “Dirty” Electricity is a National Problem Affecting Everyone’s Health in the United States . Katie Singer works on public policy with the Electromagnetic Radiation Policy Institute and is also a medical journalist . “Most people know solar power’s benefits: it minimizes dependence on fossil fuels and the corporations that provide electricity. Solar photo voltaic power systems also have a rarely-discussed shadow side: their power delivery can generate extremely low frequency (ELF) and radiofrequency (RF) radiation. How do solar powered systems generate EMR? Photo voltaic solar panels collect sunlight and convert it to direct current (DC) electricity. To provide AC electricity at outlets (since many electronic devices and appliances ultimately require alternating current (AC) electricity), the collected DC goes through an inverter. Most inverters generate magnetic fields, also called ELF/EMR (extremely low frequency/electromagnetic radiation). 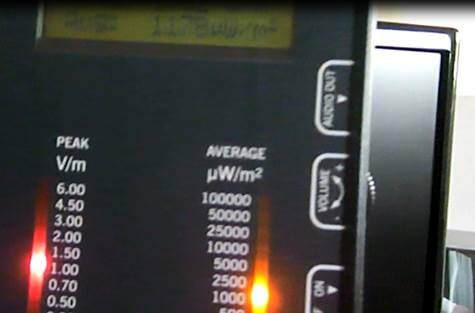 An inverter’s EMR emissions can exceed safety standards for workers (set by OSHA), people with medical implants (set by the FDA and implant manufacturers), and the public health (set by several European countries and the WHO). No US government agency has established safety standards for EMR exposure for children or pregnant women. Inverters also generate “chopped” current on 60 Hz wires, distorting the smooth, 60-cycle sine wave. This is sometimes called “dirty” power or “dirty” electricity. Dirty power can start at powerlines or within a house. It can travel throughout a building’s wires, as well as inside and outside of the building. The net meter (which tracks surplus electricity you send to the utility and what you draw when you have none stored) connects you to the grid. It may emit pulsed RF radiation–like a “smart” meter. Bill Bruno, PhD, biophysicist: an inverter’s manual may advise that if your radio or TV receives interference, move it further from your inverter. This is because even “pure sine wave” inverters use electronically switched transformers that operate at several tens of kHz, generating harmonics up to 100 MHz. Unless enclosed in metal with filters that have inductors, capacitors and ferrites (Filtron and Genisco are good quality examples) on every wire, this RF radiation will escape through the air and along house wiring”. “People with medical implants (i.e. cardiac pacemakers, deep brain stimulators, insulin pumps) may notice immediate problems: EMR emitted by metal detectors, car battery recharging systems, transmitting utility meters and other electronics can reprogram or shut off an implant” . to somewhere despite the fact that the Wi-Fi is turned off. An iPad is only safe in flight mode. ​This is a screen shot of a video taken Sunday 10-08-14 @ 6.22 pm on our daughter’s bed – it reads 6 V/m and 2246 microwatts/m2 (µW/m2). ​Wireless ceiling routers are present everywhere i.e. airports, shopping centres, supermarkets, large retail shops etc. – it is best to avoid standing straight underneath or in close proximity to one due to their high emission which covers approx. 600 m2 and support around 200 devices. 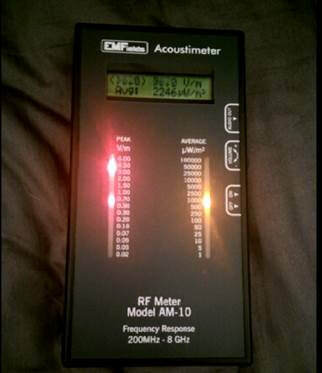 ​WiFi Radiation - Dangers of WiFi - See It Measured - How To Remediate Wi-Fi Radiation by EMF Safety Zone . ​Why We Care about Health Effects from EMF & RFR (Radiofrequency Radiation) – excerpt from BioInitiative Report 2012 . “The cumulative RFR burden within any community is largely unknown. 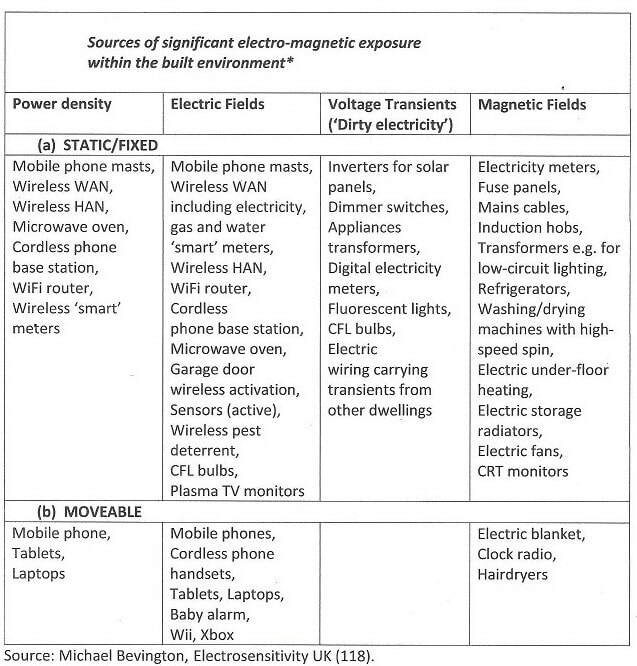 Both involuntary sources (like cell towers, smart meters and second-hand radiation from the use of wireless devices by others) plus voluntary exposures from ones’ personal use of cell and cordless phones, wireless routers, electronic baby surveillance monitors, wireless security systems, wireless hearing aids, and wireless medical devices like implanted insulin pumps all add up. No one is tallying up the combined exposure levels. Billions of new RFR transmitters from the smart meter rollout alone will raise the baseline RFR levels, and will significantly add to the existing RFR background” (120). Radiofrequency EMFs Overview refined by Powerwatch . ​Your Health Jeopardized by Radio Frequency Radiation by Pernille Schriver, Denmark (please use English translation in video) – Danish version: Mobilstråler truer dit helbred . To translate into English please click the link below, right click outside the video and choose "translate to English"